Microsoft mobile music service in a surprising turn insists on using DRM. While Amazon and iTunes services have turned their back on music copy protection, Microsoft, the smaller of the players in terms of market share on music distribution, insists on something the users clearly have condemned. In addition the cost per track is almost double than the rest of the services. Do they really belive that this will work? 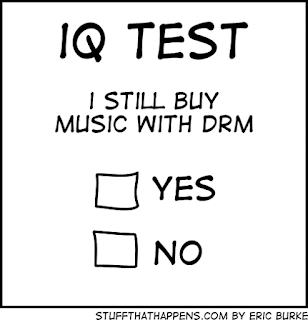 With the likes of iTunes and Amazon offering DRM-free music that you can play on any device, why would anyone choose the MSN Mobile service? There may well be people who just want to listen to the track on their mobile alone. WHAT? Who in their right mind would pay a double fee to play a song only in his/her mobile phone. Not only that who on earth would WANT to play a song that he/she bought ONLY in his/her mobile phone. Does Microsoft considers that as an actual argument on their ridiculous decision?